James Elder (1772-1836), the author's great-great-great-grandfather, seems to have been the James Elder born in the Edinburgh area on 28 Nov 1771, baptised Midculter, a few miles outside Edinburgh; he was the son of another James Elder and Jean Muckle, and originally trained in Edinburgh as a builder and stonemason. He left Britain on 5 May 1800 intending to work for the London Missionary Society in the South Seas, specifically in Otaheite (Tahiti). During the voyage, there had been a risk of mutiny and a brush with the French navy. A large number (43 out of 300) of the convicts had died en route, mostly of "gaol fever" (typhus): see separate story. The sick on board were cared for by Elder after the ship's surgeon also died (he had had some medical training in Britain and thereafter considered himself something of an expert). Presumably fear of disease was the reason it is said that Elder had to live on board the ship in Port Jackson (Sydney Harbour), while petitioning the Governor for food and permission to land. In the meantime the missions had had an unexpectedly hard time. A revolt by the native Tahitians had led to the escape aboard the brig Nautilus of 11 men, 4 women and 4 children who feared for their lives. The Nautilus itself was sadly in need of repair and was unable to take all on board; it limped into Port Jackson on 14 May 1798. Only four missionaries remained behind in Tahiti according to a report in The Times of 11 September 1799. Other reports speak of six or seven left behind. This, in addition to the effects of disease on the Royal Admiral caused some delay in the furtherance of the project. Nevertheless, the following year, the Royal Admiral was able to set sail and convey nine missionaries (including James Elder) to Tahiti where they arrived on 10 July 1801. There followed largely fruitless years of missionary work - most of the natives were simply not interested. Elder returned to Sydney on board the Seringapatam, leaving Tahiti at the end of 1807 and arriving in Port Jackson in March 1808 via the Bay of Plenty (New Zealand). On 19 July 1808, at the age of 36, he married "20-year-old" Mary Smith of Scotland "with the Governor's permission" (presumably because she was a minor) at St. John's Anglican church, Parramatta. [Scottish parish records show, however, that she was born on 31 Dec 1790, so in July 1808 she would have been 17½ years old. It seems she maintained the fiction as to her age for the rest of her life.] The couple set off for Tahiti again in October 1808 and stayed there for a little over a year. It was during their sojourn in Tahiti in 1809 that Edmund, the first of the Elders' 12 children, was born. During this period, it is said, Mary was greatly distressed over the suicide of the captain of the Perseverance who had declared his love for her. What truth there is in this tale is a matter of speculation but he was the James Faulkner who left Sydney in the Perseverance for 'the Fejees' 8 August 1808 and died there some time before February 1809, when the Perseverance returned to Sydney with a load of sandalwood under the command of the second officer. The lack of detail in newspaper reports certainly makes it look as though he committed suicide. James Elder is listed as one of the missionaries who left Matavai in November 1808 and crossed to Huahine in anticipation of an attack by rebels on King Pomare, who was their patron. Pomare was defeated and the settlement at Matavai was totally destroyed. One of the missionaries remained with the king and one stayed in Huahine, but all the others, including the Elders, left for New South Wales on the Hibernia on 26 October 1809, arriving on 7 February 1810 after running onto a reef in Fiji. For the time being missionary work in Tahiti had become dangerous, though most of the missionaries returned there on the Endeavour in the winter of 1811. These did not include the Elders, as James had fallen out with his companions and Samuel Marsden, who was looking after the Society's interests in the colony, discouraged him from accompanying them. See TEN DECADES: The Australasian Centenary History of the London Missionary Society by Rev. Joseph King, and also a relevant NZETC page. The circumstances of Elder's abandonment of the missionary life are further elucidated in the transcript (courtesy Sukie Hunter) of a later action for libel: he particularly objected to being called a "renegade missionary". 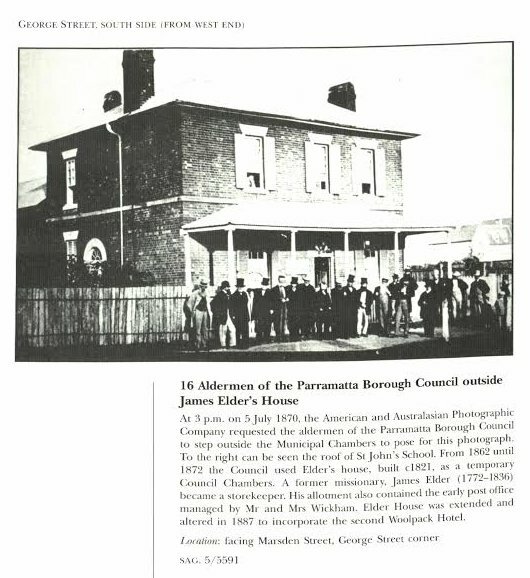 So, after a series of disagreements with his fellow-missionaries, James Elder gave up this career and subsequently became a trader, baker and grocer in Parramatta, where he built Elder House and took an interest in civic affairs. 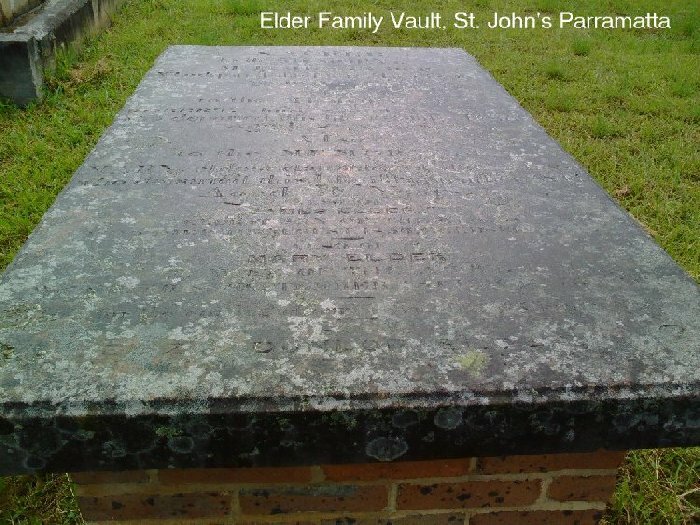 (In the General Muster List of 1823/24/25 he appears as a "shopkeeper" in Parramatta and in the St. John's burial register  he is identified as a "baker".) He was also a not inconsiderable landowner. His story is also recounted in an article published on 1 July 1927 in The Wingham Chronicle and Manning River Observer. Mary b. circa 1810, Parramatta (St. John's 15.5.1810) d. 5.9.1841 "aged 31 years"
James b. circa 1812, Parramatta (St. John's 25.1.1812) d. 11.8.1850, "aged 39 years"
Robert b. circa 1816, Parramatta (St. John's 25.7.1816) d. 30.7.1836, "aged 21 years"
Eliza Dunlop b. circa 1825, "Elder House" Parramatta (St. John's 1.1.1826) d. 28.6.1875 "aged 49 years"
James and Mary Elder are both buried at St. John's, Parramatta. Mary died of stomach cancer in Baulkham Hills on 8 Sep 1861 at the age of 73. 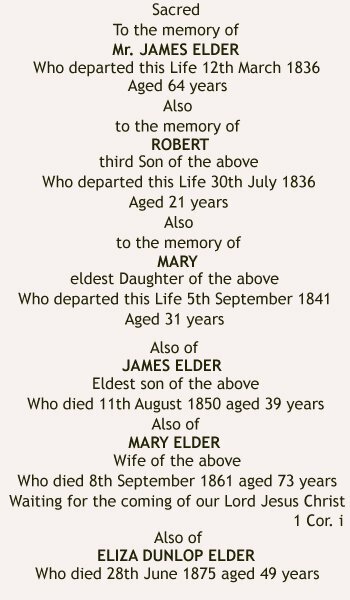 Her husband had died on 12 Mar 1836 at the age of 64.